The reader is not led gently into this other world. Far from it. We are welcomed initially with the illicit inter-species love affair between fat, eccentric scientist human Isaac Dan der Grimnebulin and his Khepri lover, Lin. The Khepri, we learn promptly, are a sub-species of human-to-the-neck, scarab-for-a-head people. Yummy! The existence of the Khepri – their evolution – is left as explained as Kafka’s Metamorphosis. But sod it, it’s fantasy, right? You can do whatever you bally well please. Set up the circumstance and explore the “human” drama that results. And Miéville does that admirably, sticking always to the rules he has devised for his universe. The narrative follows Isaac as he is commissioned by a wingless avian humanoid – a Garuda – to restore his ability to fly. This endeavour unwittingly leads Isaac to unleash a nightmarish scourge upon the rotting metropolis of New Crobuzon (think London, roughly shoved through a fantasy mincer) and it is up to Isaac and his comrades to put things right. As with Kraken, there are huge swathes of ideas pouring from every page, but while Kraken felt like a slew of unrelated short stories crudely stuck together with some sloppy character adhesive, here the narrative is focused, the characters’ agency defined, and every unearthly event is conceivable, however alien. New Crobuzon itself is a writhing cesspit of filth and squalor, each new slum described as more putrid and hopeless than the last. It’s all terribly depressing and awful, with very little good in anything, bar the richness in sentient diversity, I suppose. It’s one of those places the guidebook might say, “Most visitors regard New Crobuzon as no more than a transit stop, but for the adventurous – and wary – much can be found in the cosmopolitan city’s nooks and crannies,” like Guatemala City, maybe. Or Mos Eisley. And yet, the place is so alive with vivid description and feasible history, it becomes a real place. However, at times, the listing of these fictional districts does get a little tiresome – like someone reading a bus schedule of an unfamiliar town. I had but three qualms: Firstly, the pacing of the last act is glacial. I understand tension can be built by slowing the narrative down before the climax, but there’s a 15-page section describing a bunch of people laying cable (the electrical kind, though I wouldn’t put it past the author to be having a scatological giggle at defecation). Secondly, there’s a deus ex machina that reminded me of Chuck Norris popping up for no reason in the The Expendables 2, saving the day and then buggering off without a mention of means or motive. Finally, there’s some kind of transdimensional spider god called The Weaver that spins the “world web”, creating patterns in the universe that only it can perceive. It’s just, well, meh… Who cares? The first book I’ve picked up in a book exchange on my trip, and it’s by the same author I brought with me. 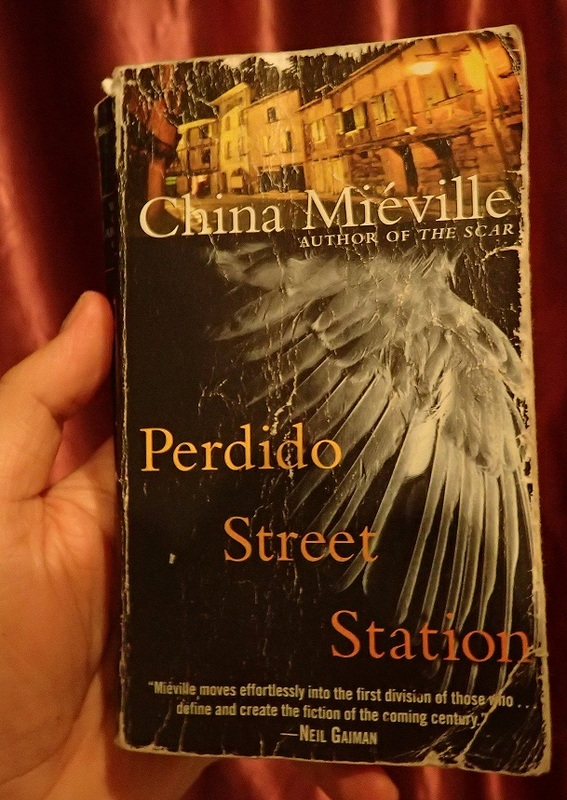 Those quibbles aside, Perdido Street Station is a tremendously exciting and enthralling read and one I’d tentatively recommend to those unaware of Miéville’s astonishing imagination. The action is strong, gory and suspenseful throughout; necessary traits for what essentially boils down to a monster story.